Life in the city can be fabulous and exciting, but when it comes to creating a harmonious and functional domestic space in the hustle and bustle, we’re often up against a few challenges. Safe to say, on the whole, today’s urban apartments and homes are rather, well… cosy. Spaces comes at a premium: storage areas and general living quarters are typically compact to say the least. Consequently, our freedom to choose from a broad range of furniture and accessories might seem a little limited: we might love to take home that full size couch settee, but there may not be any space to move in our living room if we do. When it comes to fitting out compact interiors with the right furniture, we have to be a little bit clever about it. Cloistered rooms can really breathe and flow well with the right selection of goods, and compact living can be just as pleasurable and rewarding as a home with far greater room to move. Today on homify, we’re taking a walk through some fabulous and clever furniture ideas for homes of the more compact kind. If you’re looking for furniture that not only looks great and works well, but keeps your home looking fresh and un-cramped, then this is the guide for you: take a peek and get inspired! 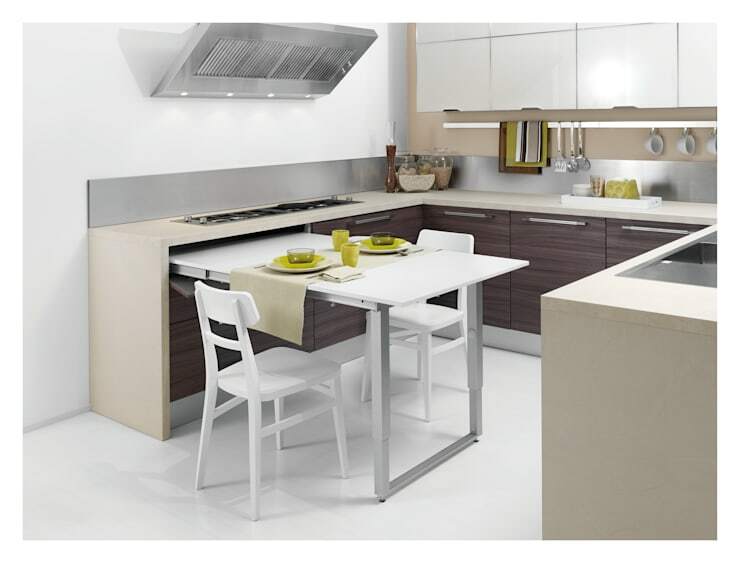 Whether you’re the type who likes to dine at a dining table, eat your meals at a meal bench or simply eat on your lap in the living room, it’s fair to say that few of us can get away without a decently functional preparation space in our kitchens. However, what if our kitchen really is barely a kitchen room at all, simply a confined nook where the sink, fridge and pantry live? Fitting a full scale, or even basic, kitchen table by a wall or in the centre of the action can sometimes be nigh on impossible. But, as we mentioned earlier, this need not be the case, as long as you’re a little clever about it. What if we could have a kitchen table that disappeared as soon as we were finished using it? Thankfully, this is a reality: with a fully retractable kitchen table like the one in this ingenious example, we can all enjoy the benefits of a fully functional kitchen preparation and dining space that neatly and thoughtfully folds away into the adjacent cabinet afterwards. This is a great solution for any tiny kitchen, an easy way to free up crucial space while giving you maximum kitchen functionality when you need it. Very few of us will ever say that we don’t love the ideas of having a space in our homes just to sit and relax, read the paper or a good novel, and entertain a guest or two over a hot cup of tea or coffee (or glass or two of wine). Living quarters are the lifeblood of any home, and are crucial to the domestic mix. However, compact homes don’t always allow for this type of space, and certainly not the space-hogging couches, chairs and coffee tables that such a room tends to need. With the simple, and clever, installation of smart seating, you can effectively create a living space in any area of your home. Here, we can see a brilliant example of what’s possible with foldable interior chairs: as well as being effortlessly retractable, they’re also highly fashionable, very trendy and an aesthetic asset to any domestic space. When it’s time to take five, simply pull them from the storage closet, set up as needed, and enjoy their comforts. To return your compact space to a flowing, multipurpose area, fold them down and store them back. It doesn’t get much simpler than that. Finding the best furniture for any home, compact or not, can be a real mission if you're not sure where to start. It's always a great idea to get some good advice, so why not chat to a professional? Foldable furniture truly is the compact living environment’s best friend, the ultimate space saver in more ways than one. While foldable chairs make an excellent addition to any space-conscious living area, when it comes to the bedroom or study, you might consider enlisting the services of an equally brilliant foldable desk. Today, most of us simply can’t live without the inclusion of a dedicated workspace in the comfort of our homes. Having said that, chunky wooden desks aren’t always going to be a possibility. 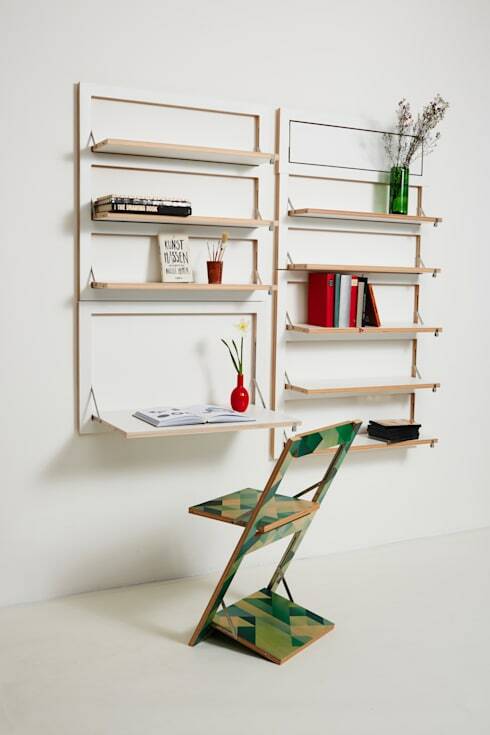 Here, we see a wonderful foldable desk for any space in the house: it functions not only as a brilliant nook in which to rest your laptop or notebooks and chisel away at the tasks of the day, but comes as part of a delightful and very attractive shelving unit, perfect for displaying books, trinkets and other accessories. Very cool, very neat, and very space-positive. Whatever our lifestyle or routines, most of us need a place in our homes to store and hang miscellaneous items. In the bedroom, a decent wardrobe or clothes rung is generally a must have for a smooth domestic life; in the bathroom, a nook to hang our towels, wet clothes and keep our toiletries and personal effects in order. In small homes, we can’t always sacrifice our space to chunky, overbearing storage units, wardrobes and cabinets. Wouldn’t it be great if there was something that could be used in multiple rooms, fulfil our functional storage needs, while remaining mobile enough to be scurried away when it gets in the way? Indeed, there is. Take this handy example as proof: a multipurpose, fully storable ladder unit that can attend to all these crucial tasks and more, while compromising next to no extra space. Neat and minimalist: a thoughtful and clever solution. When it comes to the bedroom, there’s no doubting which piece of furniture takes up more than its share of space: the bed. However, there’s no reason why you should put up with a bedroom that is completely dominated by the bed alone. While many households have traditionally looked to sofa beds for a viable space saving bedroom alternative, there are a range of options you might want to consider. 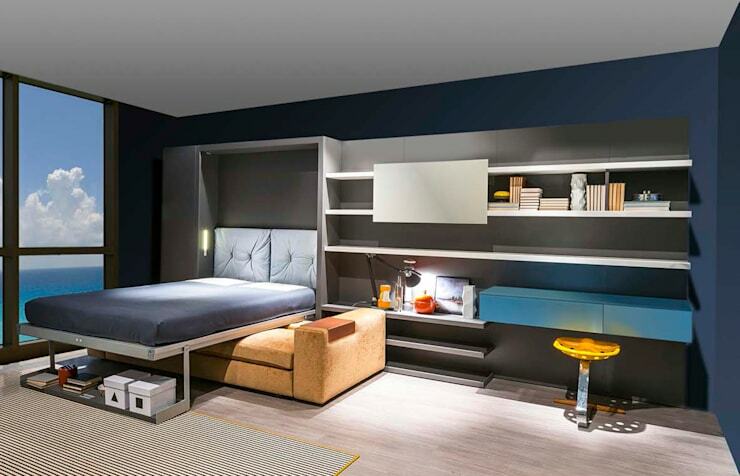 You can’t help but appreciate a bed that disappears neatly into a wall, and as we see in this example, this is something that not long works well to save space, but actually looks great too. It might be highly desirable to have a number of different bench and table spaces in our private spaces, but when it comes to compact living this may not always be possible. This need not be a problem, however. If you’re working with a single bench or table in your bedroom, for example, consider adding unique, retractable accessories, such as a foldable mirror. Here’s a table with multiple uses: a space perfect as a working desk, for holding books, perhaps a record player or stereo. 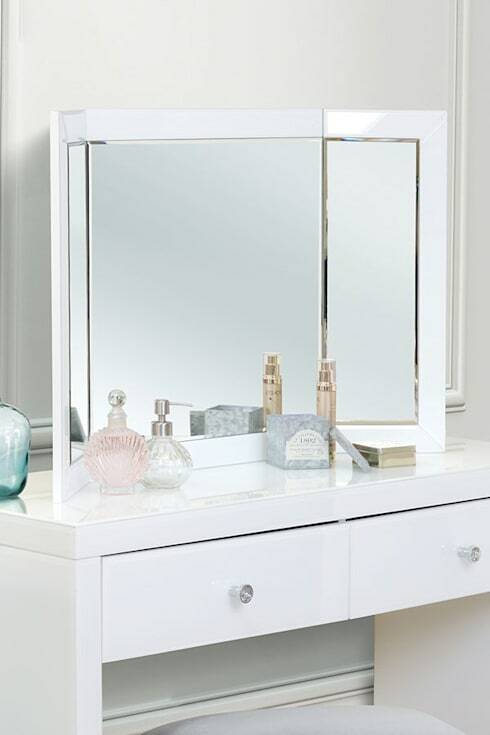 With the addition of a versatile accessory such as this mirror, it instantly transforms into a great dressing table. When you’re done making yourself look beautiful, simply fold it up, store it away, and let your multipurpose table unit take on its next role and function. Did you like the Ideabook? Why not keep the inspiration flowing with a look at How to make your small dining room look bigger? 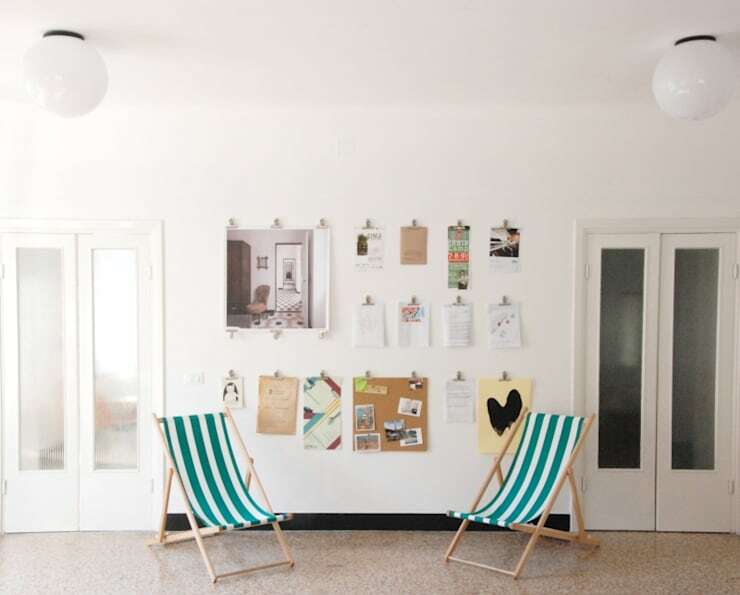 Which of these great compact living ideas did you love the most? We’d love to hear from you in the comments section below!